This article discusses why it is so important for a Personal Trainer to find out what a client believes is the cause of their success or failure. It then shows you how you can use this knowledge to have happier more committed clients. Attribution theory is a concept involved in sports psychology that investigates what people attribute their successes and failures to. Tiger Woods for example would attribute a tournament win to his ability, determination and mental toughness. In contrast, a new gym member who has lead a sedentary lifestyle and has low self confidence might see any success they achieve as being lucky. By understanding how your clients attribute their success or failure, you can influence their thinking and emotions to ensure they continue to strive for their goals. Attribution theory can also help you to understand the consequences of both success and failure for you and your client. 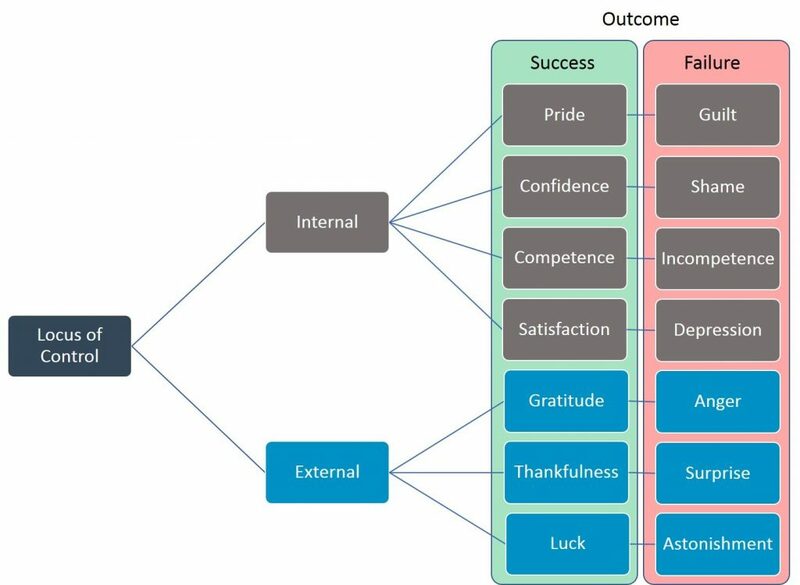 The diagram below illustrates the locus of control, outcome and associated emotions. Locus of control is broken in to two components. These refer to how much people believe their result is due to an internal or external factor. Outcome refers to the final result of the task; success and failure. When a client succeeds they can attribute it to either an internal or external locus of control. What they attribute their success to can alter the emotions that they feel and exhibit. When a client loses 5kg and attributes it to hard work and dedication on their part they will feel proud, have more confidence in their ability to achieve their long term goals and be satisfied with their gym experience. This will lead to increased adherence to their exercise programme and are more likely to renew their gym membership. If that same client who lost 5kg attributed this result to luck or another external factor such as their personal trainer, they will feel thankful and show gratitude towards their trainer. Unfortunately they will still lack self belief and will still be expecting to fail at some point. Looking at the other side of the coin, in failure clients follow the same process and attribute it to either an internal factor or an external one. We’ll take the same example of a client wanting to lose 5kg but after 8 weeks they have only achieved a weight loss of 2kg. They blame themselves. They feel guilty, that they’re incompetent and that no matter what they do they won’t achieve their goals. Alternatively if that client attributed their failure to an external force, such as their personal trainer who promised results, they will be surprised that it didn’t happen and could even feel anger that it didn’t occur. So when applying attribution theory to a fitness environment you can see that a client’s emotions are strongly influenced not only by success or failure, but also by what the client believes was the cause. If a client doesn’t achieve their goals and they decide that an external factor such as their trainer is to blame again you can see the damage that can be done to your reputation and business. So your client’s failure has ramifications for all involved. If a client succeeds you can see pride, satisfaction, and improvements in confidence that will help drive them to keep exercising. If they attribute it to an external factor such as their trainer they will most likely stick with you and spread the word. Warning: no matter how good it feels to attribute their success to you, if you really want to make a difference to your client, you need to make sure they attribute success to themselves. This is particularly important if they have low self esteem and confidence levels due to years of trying and failing to achieve their goals. So now that you know what Attribution Theory is how do you use it? Continually motivate and encourage your client using statements that link their training to internal factors and explain why they have achieved. These are statements that tell them they are achieving their goals because they are putting the work in. Continue to give feedback when clients are doing well. When instructing exercise many fitness professionals only communicate the negatives (like technique correction). Then they go silent when the client is performing the exercise correctly. If a client has achieved their goals, emphasise that it was of their own doing, even when they believe you had a big hand in it or it was luck. If a client fails, emphasise the external factors at work. This can really only apply to situations where there really were external factors at play otherwise clients won’t take responsibility for the internal control they have. If internal factors are the reason for failure, remain positive and implement strategies to overcome these factors. It’s a great boost to the ego if they believe that you played a big role in their success. However, the true benefits come from making sure that the client attributes their success to themselves.